From Ho Chi Minh City, it is very regretful if you do not spend time for a trip to visit Mekong Delta. If you have only short time to stay in Saigon, let’s join our Ho Chi Minh City tour visiting Mekong Delta just only in one day. You will have chance to cruise along a maze of small canals, through floating market which is a very popular symbol in Mekong Delta, and explore the local life. This trip provides you with a fascinating insight into daily life in the Mekong Delta and you are guaranteed to take home your own private collection of beautiful memories. 08:00 We will pick you up in Dist.1 – Ho Chi Minh City or at your hotel in Saigon center for a departure to My Tho. Enjoy the scenic journey along the National Highway bordered by green rice fields. Arrive in My Tho, we first visit Vinh Trang Pagoda, take a leisurely boat ride along the river, view the stilt houses and the fruit plantation and fishing villages along the river bank. Proceed to Tortoise Island and have lunch in the orchard. After the lunch, we continue taking a boat ride to An Khanh – a less touristy attraction in Ben Tre, enjoy cruising on a hand-rowed sampan under the shadow of the water coconut Have a short cycling trip (applied for private tour/if time permitted), then enjoy seasonal fruit & honey tea to the sound of "Southern Vietnamese folk music", performed by locals. 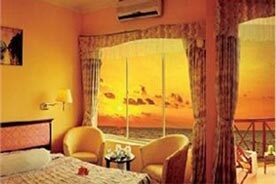 Visit a family business which epitomizes the idyllic rural lifestyle, taste the delicious coconut candy & observe the pastoral life as you roam through the fruit plantation and village. Take the bus to return to Ho Chi Minh City. 17:00 Arrive in Ho Chi Minh City. 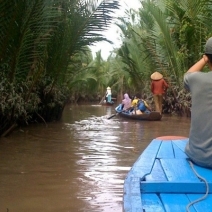 End the Saigon Tour visiting Mekong Delta.